In December 1930 New Zealand's first jazz recording was made – on film. Essentially a very early music video, the one-minute publicity film showed Rotorua band Epi Shalfoon and His Melody Boys performing a New Orleans/ Dixieland arrangement of the popular Māori song ‘E Puritai Tama E’ (AKA ‘He Pūru Taitama’). Although long acknowledged by jazz musicians and fans as New Zealand’s first jazz recording, it was not until the film was digitised by the New Zealand Film Archive that it became widely known as a part of New Zealand's popular music culture and history. It was also a film with a scandal attached: Shalfoon refused to pay. He was taken to court, and the case was covered in sensational style by NZ Truth. 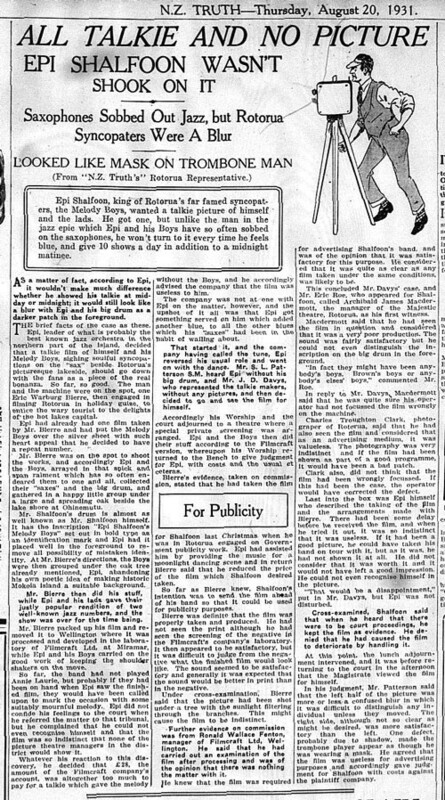 All talkie, and no picture: how Truth covered the court case about the film, 20 August 1931. 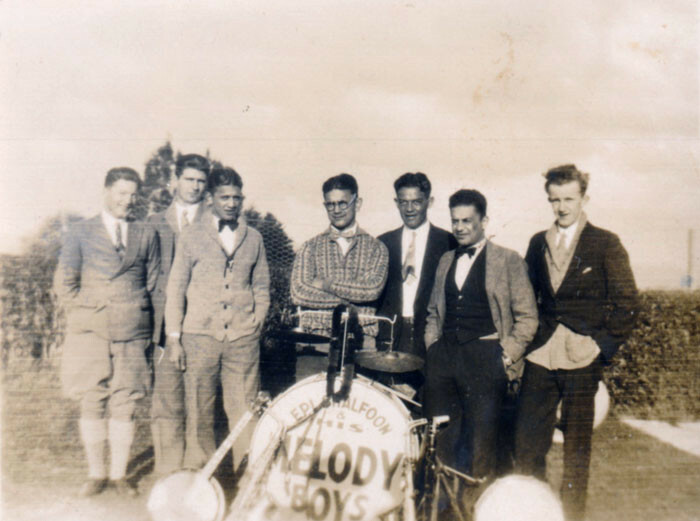 In October 1930, less than a year after the arrival of talkies in New Zealand, Epi Shalfoon and his Melody Boys were contracted to appear in a Tourism Board publicity film being shot in Rotorua. As part of their payment the band was given the opportunity to make a short film at a reduced cost to them. Both the Tourism Board short and the Melody Boys’ advertisement were shot in December 1930: the Melody Boys’ film was just under a minute long. The band made the film to show as a trailer in cinemas to publicise their appearances; at the time they were Rotorua’s leading band, and they also played dances in the Bay of Plenty and Waikato. In the film the band is dressed in casual white shirts and black trousers: more normal attire for them than the “Arawa Braves” costumes and blackface they endured for the Tourism Board film. 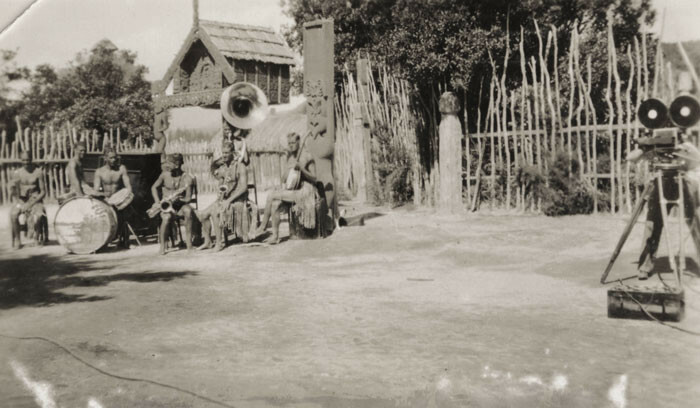 The musicians are arranged at the entrance to a replica pā in Rotorua (possibly Whakarewarewa). 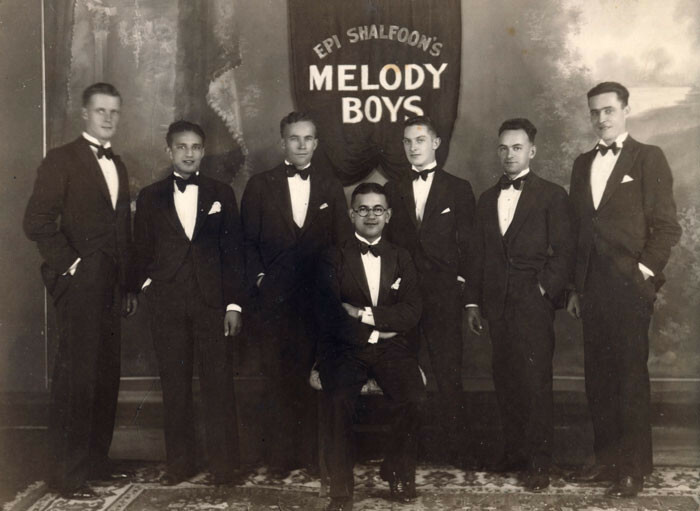 Shalfoon and the Melody Boys' short, jazzy arrangement of ‘E Puritai Tama E’ is jaunty and effervescent, bordering on ragtime, with call-and-response saxophones accenting the dominating banjo and sousaphone rhythm. It is unknown why the Melody Boys chose to use ‘E Purutai Tama E’ for the film rather than a jazz standard or an internationally known pop song, though it was very popular in New Zealand at the time. Kingi Tahiwi wrote it in 1909 to win the heart of a young woman, Jane Armstrong: she later became his wife, so it must have worked. The song remained private until Tahiwi’s brother and sisters, Henare, Weno and Hinehou, who had formed a vocal group, needed material for recordings they were making in Sydney in May and June 1930. The song is overtly sexual, a boast of the male suitor’s physical as well as mental prowess (as folklorist John Archer points out, Tahiwi was competing with strapping farmers for Armstrong’s attention, and as a law clerk and interpreter he was not as muscular). 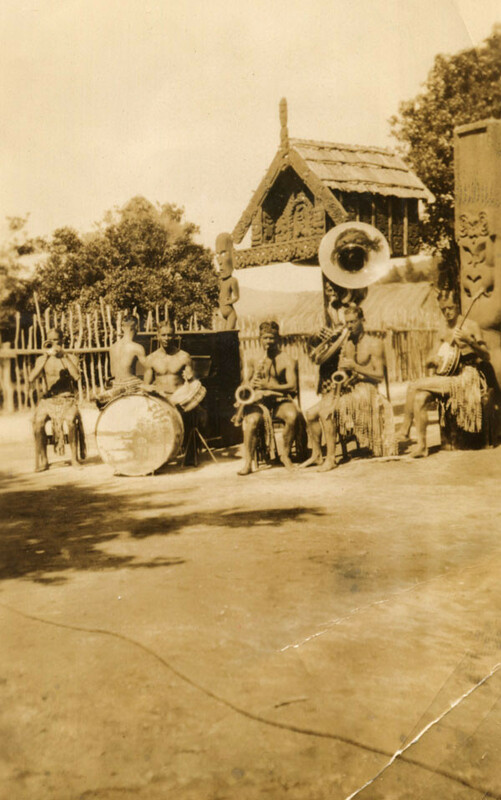 The recordings that the Tahiwis made were released in August and September 1930 and quickly became very popular, helped by the fact that the Tahiwis had performed regularly as a group and individually since their return from Sydney. The court case was excitedly reported in NZ Truth and a number of other newspapers (though with less salacious enthusiasm than the notorious tabloid). In August 1931 the court case began by outlining the production and the reason Shalfoon wanted to make a sound film of the band. The prosecution outlined the situation of the filming in detail, including the fact that the cameraman stood under a tree. They also examined the process of developing the film, assuring the court that no mistakes had been made, and that the final product was – in the plaintiff’s opinion – perfectly fine. So they were owed the processing costs from Shalfoon. The defence rebutted by calling Archibald MacDermott, the manager of Rotorua’s Majestic Theatre, who was asked if the film was of the quality required. In MacDermott’s opinion it was of very poor quality: the sound was only just useable, but only just. Visually the film was useless, because the band members’ faces cannot be seen properly. Importantly, the details on the bass drum – displaying the band’s name – cannot be read. At the beginning of the film, Shalfoon states: “I wish to introduce to you Rotorua’s famous jazz band”, but he does not name the band. In fact, because of the audio and visual skips in the film, Shalfoon actually only says “I wish to introduce to you Rotorua’s famous ja…”, so the viewer does not actually know that they are a jazz band. They could be anyone’s “Melody Boys”, and everyone’s features are a blur. The magistrate and court officers watched the film and also asked the Melody Boys to recreate their performance. After consideration, the magistrate agreed with the defence and Shalfoon. The film was of very bad quality and useless for promotional purposes, so he found in Shalfoon's favour. The film quickly became legend in the jazz community. None of them knew exactly what was on the film – no one seems to have seen it outside of Shalfoon and presumably his sidemen – yet everyone knew about it. Shalfoon had publicised the film widely when it was being made, and the later court case also spread its notoriety. In the early 1980s, a new generation of jazz fans learnt about the film when Dennis Huggard, the premier discographer of New Zealand jazz highlighted it in his booklet Jazz Recordings of New Zealand 1930-1980. Since digitisation, Shalfoon’s minute-long film has taken its rightful place in New Zealand jazz history as the first wholly locally produced jazz recording. The lyrics, melody and history of ‘E Puru Taitama’ can be read at John Archer’s website New Zealand Folk Song. In the years since Kingi Tahiwi wrote it, there have been many variations of the lyrics and their translation.